By Reverend T. R. Edwards. The festival is not what it was in the days when frenzied devotees hurled themselves beneath the wheels of the car, but still it remains an extraordinary instance, of Pagan fanaticism and fervor. This well known missionary tells us all about the festival, and illustrates his description with photos, of a striking character. The great car of Juggernaut, or Juggernath! The very name sug­gests the reading books we used at school, which told us of the sanguinary horrors of the festival and the hideous trail of blood left by the murderous wheels. All this, of course, is past and gone, thanks to the beneficent rule of the British in India - a rule which, one is bound to say, is fatal to what the worldling is apt to call "the pic­turesque." Even today, however, one of the most charac­teristic sights to be witnessed in India is that furnished by the worship of the god Juggernath. To begin with, there is the im­posing temple, surrounded with an atmosphere of age-long mys­tery and super­stition. Next comes the lofty and ponderous car, gaudily painted with Hindu mytho­logical scenes. Let me here afford you a near view of one of the cars of Juggernath -an excellent idea of its size is gained by comparing it with the figure of the native on the right. You will observe that the construction of the car is extremely rude, and round it runs what looks like a crazy balcony. The wheels are more or less sunk in the sand, and on the right we see the great cables used for hauling on the festival day. 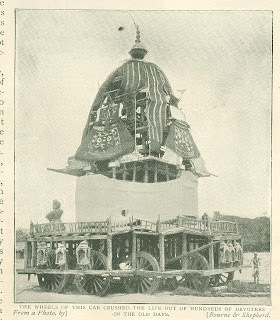 In contemplating this extraordinary temple on wheels, however, it must be borne in mind that the one shown in our photo is "in its stable," so to speak; its appearance on the great day itself being far more gay and animated. But this will be evident in the other photos. Besides the temple and the car there are the images, grim and hideous, which are worshipped by adoring thousands. And, above all, there are the vast crowds which the eye tries in vain to estimate. You may readily imagine, then, that a pageant made up of these elements forms a unique and magnificent spectacle. So you cannot do better than ac­company me to Serampore and behold it for yourself. Serampore, you must know, is about twelve miles above Cal­cutta, on the right bank of the River Hooghly; and the place is famous because it was here that the first Protest­ant mission station in India was planted. 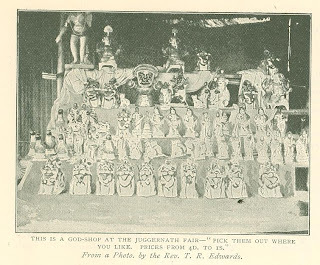 But Serampore is also famous for its Juggernath worship. There are two chief festivals claiming our attention­ - the Snan-jatra, or bathing ceremony, and the Roth-jatra, or car expedition. The next photo reproduced gives us a splendid view of the scene presented on the first of these occasions. In the background the temple of Juggernath raises its lofty head, standing in its own walled enclosure. 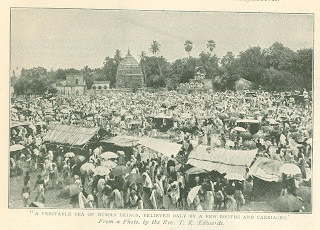 Behind is a forest of palms and mangoes; while the foreground is made up of a veritable sea of human beings, relieved only by a few booths and a sprinkling of carriages. 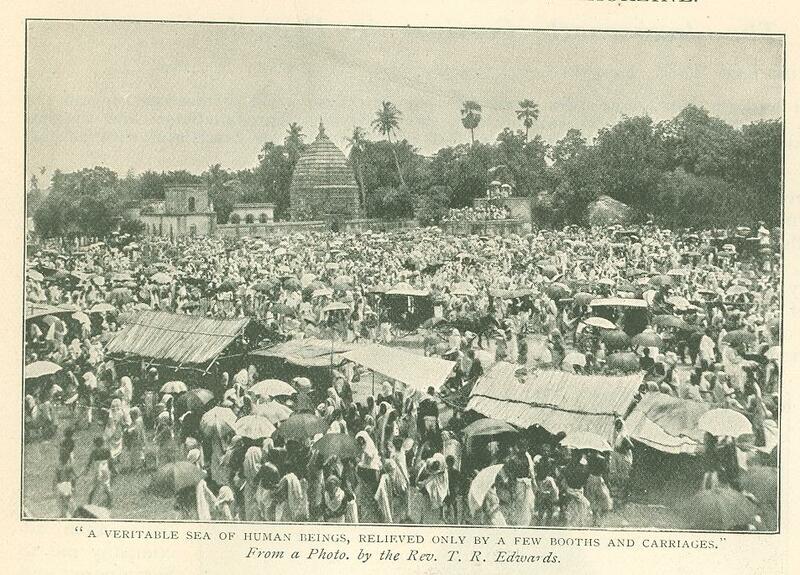 As the sun is blazing down with all its Indian fervor, those natives possessing umbrellas have prudently put them up. Every person present is on the tip-toe of excitement and expectation, waiting for the ceremony to commence. All eyes are turned towards the platform of brick and masonry at the rear, where the great function is taking place that has attracted all these multitudes. The fact is, Juggernath is receiving his annual public bath. During the greater part of the year the god resides in considerable state in the temple, but on this occasion he is carried forth, carefully wrapped up in a thick cloth. His brother Boloram and his sister Shubhodra dwell with him in the temple, and now accompany him on his journey forth. Juggernath himself is ex­ceedingly heavy, and it requires several men to carry him. They pull and strain to get him up to the top of the platform, and then the covering is removed and a gorgeous umbrella held over his head. This done, the god is ready for his bath. Amid an impressive silence, the officiating priests take water from the holy Ganges and pour it over the idol's head in full view of the assembled thousands. Every eye is strained to catch first glimpse of the god, and witness the ceremony generally. 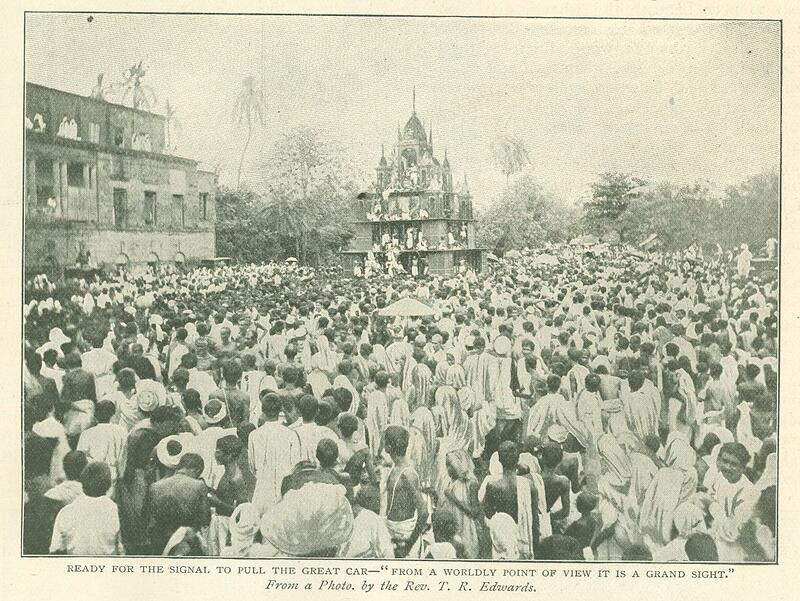 Every phase of the ritual is hailed by thunders of "Hurri-bol-hurri-bol" ("Shout the name of God "). After the water has been poured over Juggernath, and his body carefully wiped with a cloth, this particular ceremony is at an end. The orthodox Hindus believe that by coming to Seram­pore and witness­ing the bathing ceremony they acquire unbound­ed merit and more or less certain salvation. 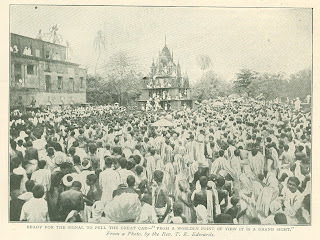 The more enthu­siastic devotees now press forward to the platform, where they make their obeisances to the god, while the majority of the people (human nature being the same all over the world) turn away to en­joy the fast and furious fun of the fair, as repre­sented by performing bears, show-booths, jug­glers, snake-charmers, etc. But let us, too, approach the platform for a closer view of the images. As a matter of fact, they are merely three misshapen logs of wood. Juggernath himself is neither lovely nor artistic. He is painted black. Two white circles do duty for eyes, and two more broad stripes are intended to represent respectively the nose and mouth. None of the figures have either arms or legs. 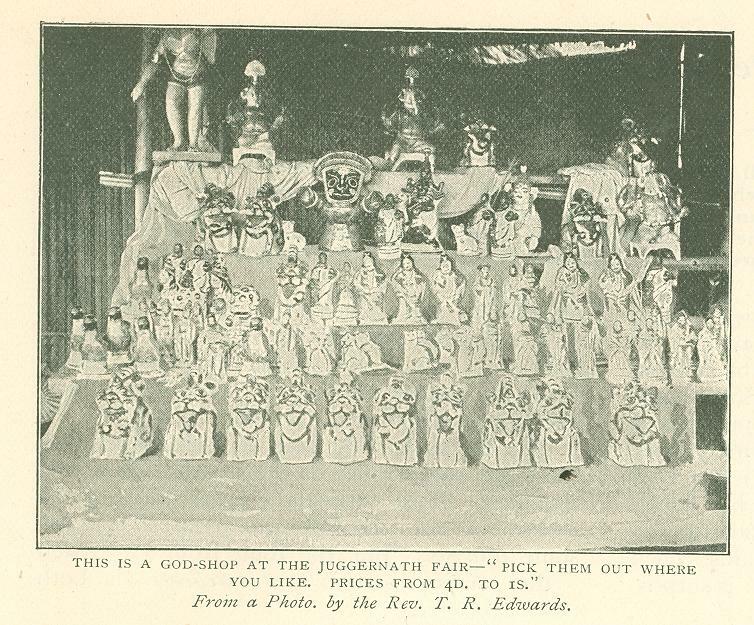 It seems rather curious to call such a grotesque idol "Lord of the World," but that is what "Juggernath " means. When he appears in public in his car, however, the obliging priests provide him with temporary silver arms; but these are merely "properties" for stage use, so to speak. As soon as the enormous concourse have finished worshipping the idols, they are covered up again and carried back to the temple, there to await the great ceremony of the Car Journey. This is undoubtedly the chief event of the year, and most accurately is it portrayed for us in the next photograph reproduced. 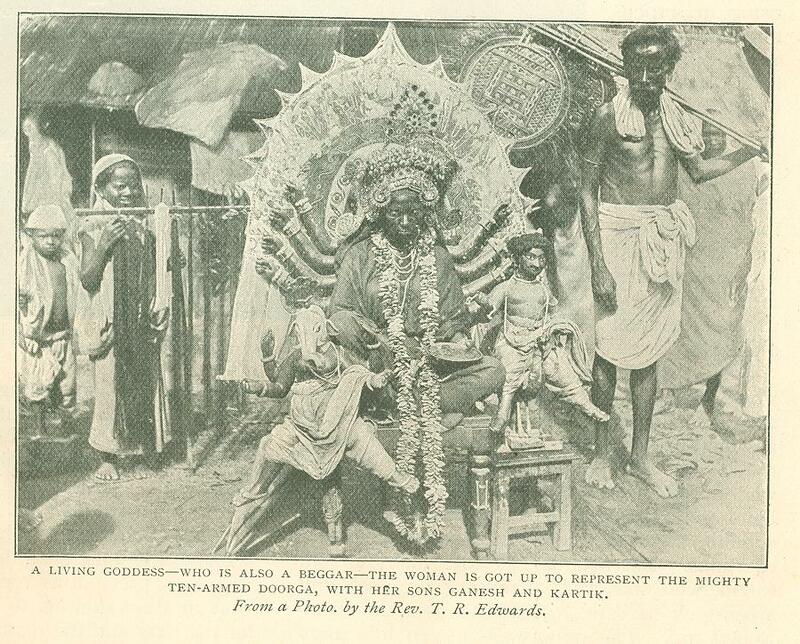 Really, a study of this picture is almost as good as a trip to Serampore at festival time. Observe the vast throng in the photo, and remember that this can only show a very small section of the assembly. All along the route taken by the car the road-sides are packed with countless devotees and spectators. Walls, banks, and house-tops are all crowded to their utmost capacity, and almost beyond it. From a worldly point of view it is a grand sight, but also one which gives intense pain to the missionary, who realizes at a glance the tremendous hold which idol worship still retains upon India's millions. Let us watch the ascent of the gods to their positions on the great car. They are presently brought out of the temple as before, all covered up and tightly corded round: Musicians with large gongs and drums accompany the idols, and make a terrific uproar, the crowd hailing their approach with repeated roars of "Hurri-bol" Arrived at the car, the gods are hauled up in the most unceremonious manner to the topmost chamber of the lofty vehicle. During this trying operation they look like nothing so much as bales of goods swung aloft, instead of august divinities for whom, in the days gone by, thousands of fanatics literally laid down their lives. When the idols have been duly set in their " high places" their coverings are withdrawn and their temporary arms fastened on; then they are ready to be pulled. This operation, however, cannot take place until the British magistrate - who is present with a large body of police - signifies his assent. But, you will ask, what are the magistrate and his police doing here? Well, it is his duty to see that excess of fanaticism on the part of the spectators does not result in surreptitious loss of life beneath the wheels of the great car, as in the olden days, when the natives positively vied with one another in casting themselves beneath the wheels, and the car left a hideous track of mangled corpses behind it. Moreover, the magistrate has to see that the hauling ropes are sufficiently strong; and behind him stands an officer carrying a gun, the firing of which is under­stood by all to mean that the pulling must instantly cease. These officials may be observed on the right of the photo. I have been describing. Should the car threaten to go in a wrong direc­tion, or any accident occur by which life is endangered, off goes the gun, and the car at once comes to a standstill. Thus it is that no victims are nowadays claimed by Juggernath. I myself have witnessed the great procession for many years, but have never seen or heard of a single fatality. On one occasion, however, the famous idol all but claimed a sacrifice - and that a far more important victim than a mere Hindu. It was, indeed, no less a personage than the magistrate himself! There had been a great deal of rain, and the ground was slippery from the trampling of countless feet. Just as the signal was given to pull the car, the magistrate slipped and fell right in front of the huge erection. The gun was instantly fired, but it was too late: the car was already in motion, and with such "way" on that it was not brought to a standstill until it had passed completely over the unfortunate official's prostrate form! A thrill of horror passed through the multitude, and there was a rush to peer beneath the wheels. Everyone, of course, expected to see the British Raj crushed to death; but, wonderful to relate, he crawled out between the wheels without even a bruise. He had fallen in such a way that the great cumbrous wheels only just grazed his side. But had he been injured it would no doubt have injured British prestige in a curious way. Without doubt the natives would have pointed to the incident as an indisputable proof of Juggernath's irresistible power. "See," they would have said, "even the highest official of the Government is helpless before our god! " As a proof of this, I may mention that, another year, the number of Hindus at the festival was so small, and the car so heavy, that Juggernath simply could not be drawn. The great car stuck in the mud, and no efforts could move it. "There you are," declared the admir­ing populace, "when Juggernath makes up his mind that he will not move, it is impossible to make him budge." You see, their own lack of power actually brought fresh honor to their god. The sequel, however, put a different complexion on things - but this the devotees care­fully overlooked. When all else failed, an English jack-screw soon compelled Juggernath to change his mind! Let us now get as near as we can to the car to watch the actual pulling. The god is quite ready for his annual trip, and his priests and attendants have clambered on to the car, as may be seen in the photograph. The huge ropes are then made fast to the front, white hundreds of men rush forward to "haul on," considering themselves highly privileged if they get a place. At length a weird gong sounds, and a vener­able Brahmin standing on the front of the car gives the signal. The ropes tighten, the car creaks and groans and quivers and shakes. Then, amid rolling thunders of applause, it lumbers on its way, much as we see it in the accompanying photo. 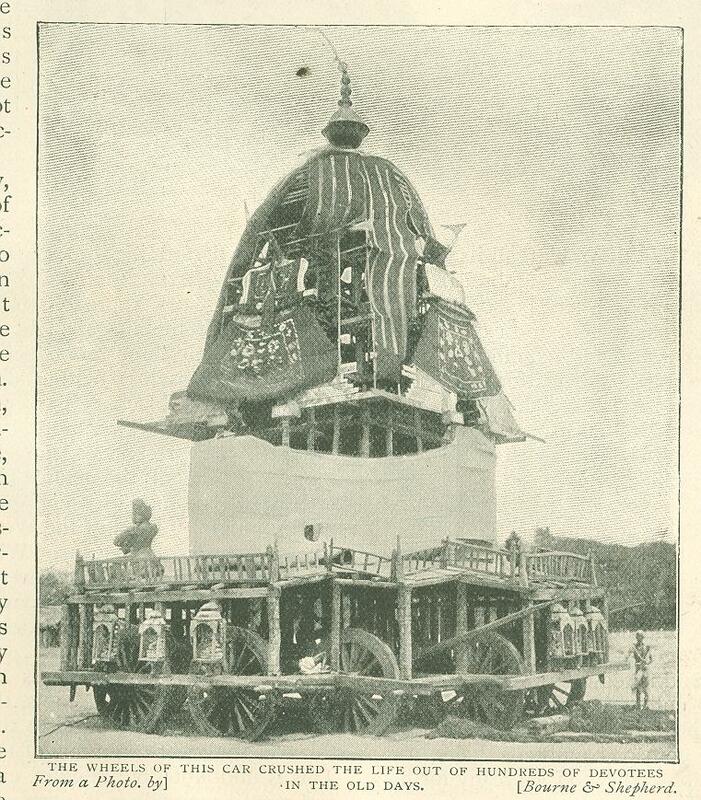 This, by the way, gives a really magnificent idea of the actual pulling of the Juggernath car. Here, again, on the right, we see the magistrate and his officials watching over the lives of the people. All along the chosen route the people hail the car by waving their hands and shouting their loudest. It is indeed an extraordinary spectacle, and one well worth going all the way to India to see. When the car has arrived at its destination the idols are taken down and carried into the temple of another god. Here they stay until the priests are ready for the return journey to their own temple; and this is conducted with the same great ceremony. During the ten or twelve days occupied by this festival a great fair or mela is held; and it is not too much to say that miles of temporary shops are erected, whilst primitive merry-go-rounds and queer side shows provide amusements for all tastes. Let us pass along the line of shops and see anything there may be of interest. Why, what have we here? The very first booth we inspect is a god-shop! This sounds fantastic and extra­ordinary, but here we are at an emporium, where gods are sold to fanatical devotees at prices ranging from 4d. to 1s. - "prices to suit all pockets" ­in fact, our booth contains rows upon rows of outlandish images for sale. You see, every Hindu householder has his own domestic god, and he has here quite a large number to choose from. The images, you will obcerve, are quaint rather than beautiful. By the way, it is esti­mated that the number of divinities wor­shipped in India is something like 330 millions! We next come to the most curious sight in the whole mela. This is the "living goddess," repre­sented in our last photograph. Judging from the plate of voluntary offerings on her left hand she finds the role a very paying one. The woman is, in fact, got up to repre­sent accurately the far-famed and mighty goddess Doorga. She has ten arms (eight of them "pro­perties"), and by her side are placed her sons, Ganesh and Kartik. The latter is on his mother's left, and rides a peacock; whilst the former is provided with an elephant's head. Doorga's face, neck, and arms are painted - a brilliant yellow. If the truth must be told, this heavenly tableau vivant business is but the ingenious device of an Indian beggar or female fakir for extracting alms from the numerous spectators at the Juggernath festival. But, you will ask, has she anything to give in return for the offerings? Why, yes, of course. She pours forth all kinds of blessings upon the heads of her benefactors, who fondly imagine that good wishes of this kind are as efficacious as if they proceeded from the real goddess her­self. And, of course, they are. Originally published in the Wide World Magazine. November 1899.